There was plenty of joy in the air today as Gov. 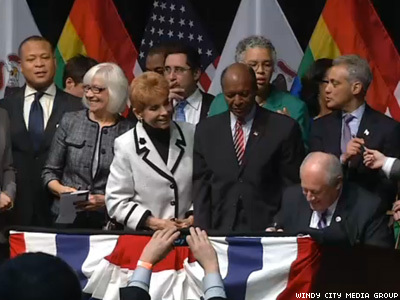 Pat Quinn signed marriage equality into law in a Chicago ceremony. It was an emotional and celebratory day in Illinois today as Gov. Pat Quinn signed the state’s marriage equality bill into law. The signing ceremony at the Forum, an arena at the University of Illinois at Chicago, featured speeches by several politicians and a moving rendition of “America the Beautiful” by the Chicago Gay Men’s Chorus, but some of the loudest applause went to a gay couple who’ve been together more than 50 years and will finally be able to call themselves newlyweds. “We have never wanted special rights or extra rights,” said Patrick Bova, who will finally be able to marry partner Jim Darby. “We have just wanted to be equal.” For them, marriage will mean, among other things, that Bova will be eligible to be buried next to Darby, a veteran of the Korean War, in Abraham Lincoln National Cemetery. Lincoln, who spent much of his life in Illinois, was invoked by several speakers, and Quinn signed the bill on a desk on which the 16th president wrote his first inaugural address. Rep. Greg Harris, the bill’s chief sponsor in the state House of Representatives, cited the progress represented by the bill by saying, “We never walk back,” a paraphrase of Lincoln. Several speakers thanked the many elected officials, especially Harris, and activists who campaigned for the bill. Sen. Heather Steans, the chief sponsor in the Illinois Senate, said Harris had spent his career building toward this moment, while another state representative, Kelly Cassidy, “crossed the state over the summer and fall” to build support for the measure. Steans noted that Cassidy could not be at the signing due to her mother’s recent death in Florida, but Cassidy’s partner, Kelley Quinn, and their three children were there. Steans said she was “delighted” that the couple could now say their vows in Illinois. The senator also saluted Rep. Naomi Jakobsson, who left her dying son’s bedside to cast her vote for the marriage equality measure November 5. The state Senate passed the bill Valentine’s Day, but it failed to come to a vote in the House by the time the regular session ended in May; Harris had said he was not certain there were enough votes to pass it. Finally, in the so-called veto session, held in the fall to take care of unfinished business, it was approved by a vote of 61-54. The law will go into effect June 1; with the action in Illinois, 16 states and the District of Columbia have enacted marriage equality. Watch video below of Bova and Darby, and of state attorney general Lisa Madigan, courtesy of Chicago TV station WMAQ.